Trading your car in for a hybrid or electric vehicle is a sure way to lower your fuel consumption, but there are also ways to save gas without shelling out the cash for a new ride. How you drive your car can drastically affect fuel economy so, with a little care, you can maximize what you’ve got. Here are a few ways to drive with a green foot – instead of a lead one – and a few apps that can help. Before you start thinking about improving your fuel economy, it helps to have a baseline. 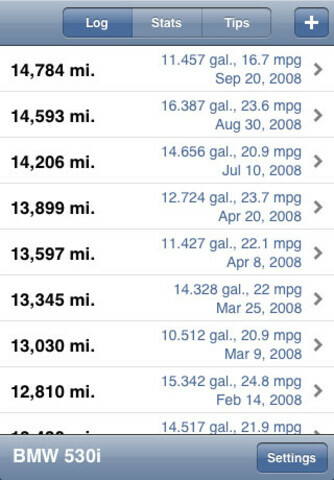 GasHog ($0.99 at the iTunes App Store) (pictured) and FuelLog (free on Google Play) allow drivers to track their vehicles’ fuel economy by entering odometer readings and the cost of fuel each time they fill up. With apps like these, you can determine your car’s average fuel economy and compare its performance on different roads or in different driving conditions. Check the data against published fuel economy numbers from the EPA to see if you’re on the mark. To improve a car’s mileage, smoothness is the key. Hard acceleration and hard braking both waste energy, so the best way to drive is to maintain a reasonable average speed. If the speed limit on a road is 65 mph, going 55 mph or 75 mph won’t help with mpg; maintaing a consistent speed is more important than going fast or slow. 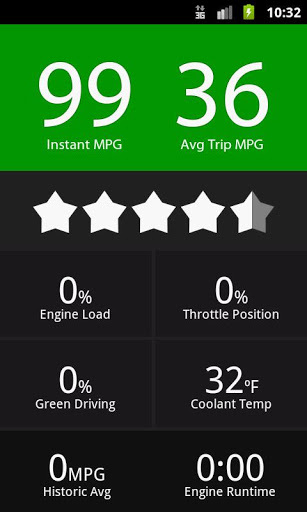 InstaMPG ($0.99 on Google Play) gives a constant mpg readout to let you know how you’re doing in real time. Like the radar-equipped speed signs that dot highways, this real-time source of feedback can warn a driver with an excess of lead in his or her feet. This app will mostly help people with older cars, since many new models include an mpg readout in their trip computers, or as a dashboard icon or gauge. The way InstaMPG calculates mpg is also a bit shoddy. It uses a smart phone’s onboard accelerometer to read rates of acceleration and deceleration, but it can’t account for variables like whether the driver is using the air conditioning, or what gear the car is in. InstaMPG also bases its calculations on data from other users with the same car. So, while the developers say the app supports 99 percent of cars made after 1984, you might be out of luck if your daily driver is a 2001 Qvale Mangusta. Other apps also go a step further and provide tips (some might say back seat driving) to help improve your green driving technique. FuelFit ($0.99 on Google Play) turns green driving into a game, awarding points for good driving and subtracting them if it thinks the driver is wasting fuel. This idea did not come from the world of apps. Apparently taking a page from the Wii Fit, carmakers, including Ford, Honda, and Toyota, are installing green driving displays in their hybrids to spur owners into driving correctly. These displays, which feature magically-appearing leaves or color-changing orbs, give visual cues to keep them in the green zone. FuelFit (pictured) offers a more straightforward bar chart, along with a digital speedometer. There’s also a heads-up display mode that reverses the image so drivers can view its reflection on the windshield, and a night mode. Display slickness aside, manufacturers’ systems might be more accurate, since they interface directly with a car’s computer. FuelFit is a good option for people who don’t own a newer hybrid. Just like a videogame, FuelFit also includes different difficulty levels, from novice to hyper-miler. Drivers looking for more specific feedback will have to keep looking for the time being. 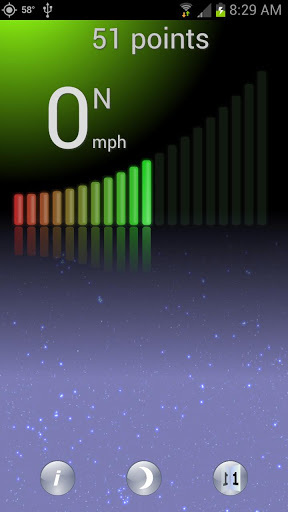 Green Driving Gauge (free on Google Play) warns of excessively hard acceleration or braking and “high speed.” Economy Drive (free on the iTunes App Store, although most content requires a $0.99 in-app purchase to unlock) has a catalog of tips, but doesn’t give real-time feedback. Another way to improve your mpg is to choose a more fuel-efficient route. Avoiding stop signs and red lights means less time spent idling, a straighter route will allow you to drive more smoothly. Fewer hills and curves means less dramatic acceleration and deceleration, as does a route with a more consistent speed limit. Unfortunately, this is one area that there really isn’t an app for. Green Driver (free on iTunes and Google Play) calculates routes that avoid red lights, but only in Portland and Eugene, Oregon. However, even if you’re performing at your best, your car may not be. Efficiency Pro ($3.99 on Google Play) interfaces with a car’s OBDII connection to check for issues with the engine. This may require a little more mechanical knowledge than the average consumer has, but it should at least point users in the right direction if they need to take their cars to a mechanic. A handy feature is the ability to clear the Check Engine Light, which should save time and money if the “idiot light” goes off for no reason. It also provides instant and trip average mpg readings. A car can only achieve so many miles per gallon, but driving conscientiously can help you make the most of what you have. Driving smoothly, avoiding stop-start traffic whenever possible, and keeping your car in good shape will all help. How can tech help? The best use of apps for green driving seems to be mpg calculation; there are a few options here and it’s a good way to track your progress over time. For now, the ecosystem of route-planning apps simply isn’t there, and drivers will have to decide if having an app grade their driving in real time is useful or just a distraction. Being able to check an engine to see if it’s running properly could be useful if vehicle owners can learn their car’s computer codes. An app can’t drive a car and, consequently, green driving apps make a smartphone into a black box, not a copilot.